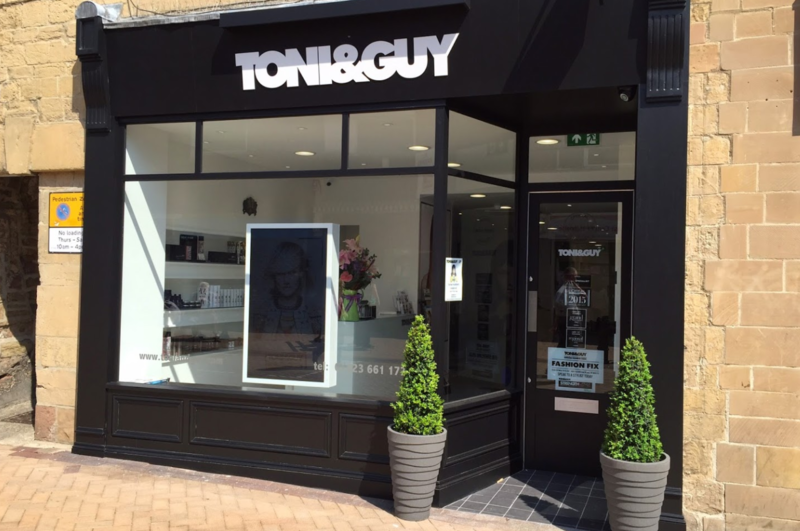 TONI&GUY Mansfield opened in Mansfield town centre in 1999. As a salon we pride ourselves on delivering the highest standards of customer service to each and every client. We are dedicated to providing the ultimate salon experience with our strong team of talented, passionate stylists and technicians who will ensure your TONI&GUY experience ia fabulous one for both you and your hair. Our talented team of stylists and technicians are on hand to give you expert advice and create hair that is individual and easy to live with, interpreting fashion trends with versatile, wearable styles. Thank you for your 5* review Greg. I’ve been to a few branches around the U.K. and Mansfield is by far one of the best. From the moment I stepped into the salon, I was whisked through to having my hair washed. I was offered a drink and Anita was very understanding of the style of hair cut that I wanted. I don’t live in Mansfield but i’ll definitely keep coming back here to have my hair cut in the future! Thank you so much for your lovely 5* review Melissa. We realt appreciate your feedback and could not be prouder of our team at Mansfield for the service that you recieved at you visit, many thanks. Perfect hair cut and colour as ever. Gemma’s colour skills are fantastic & attention to detail is impressive. Chris’s cutting skills are just fantastic. Always friendly, professional - he is such an asset to your salon. Can’t imagine trusting my hair to anyone else. Thanks team! Thank you for your lovely 5* review Anne. Lovely experience, All staff very friendly, Anita did brilliant cut, just how I wanted it. Thank you for your 5* review Jackie. Always nice to hear that our clients enjoy their experience with us and that you had a brilliant cut and blow dry with Anita. Chris understands my hair and cuts and styles perfectly. Thank you for your 5* review Elaine, great to hear that you are happy with the cut and blowdry service with Chris. Thank you for your 5* review Margaret. Wonderful to hear that you are really happy with the services you recieved at our salon with Shane and Chris, especially with it being your first visit! We look forward to welcoming you back really soon. Thank you for your 5* review Janet. Amazing to hear that you wouldnt go anywhere else and that you had great colour and cut services with Gemma and Liam. Sorry to hear your disappointment with your little girls cut. It can be quite difficult to ensure childrens cut are perfectly even especially when they are unable to sit on their own. We do apologise but we do always try our best. Very impressed as usual. I usually have a balayage colour so I wasn’t ready for a colour appointment yet. I had a toner to refresh my colour and was really pleased with the results; made me feel like I had had my colour done again. Anita is a fantastic stylist who knows how I like my hair cut and styled and as usual I left the salon feeling incredibly happy. Thank you for your 5* review Sarah, its amazing the difference a toner and a fresh cut makes! Really pleased to hear how happy you were with your services by Shane and Anita. Thank you for your 5* review Susan. Chris was the most professional hair manager I have ever known. His hair cut, styling and advice were excellent. Thankyou for your 5* review Carol, really glad to hear that you found your salon visit with chris excellent, he is a great hairdresser. Thank you for your 5* review Belinda, really pleased to hear that you are happy with the cut and colour services by Chris and Gemma. On booking my appointment, the receptionist was very accommodating when I explained I wanted to make an appointment for both daughters to have their hair done together. I was made aware of the offers the salon offered, which was most helpful! Arriving at the appointment I found both stylist very professional and engaged in the ideas the girls had for their new style. Both stylists explained how they were styling each child's hair throughout making sure both I and the girls were happy. We even got advice on shampoo as both girls a swimmers! Very relaxing, clean environment great value for money, definitely re booking. Thank you for your 5* revierw Clare. Really pleased to hear how accomodating our staff were from start to finish of your daughters appointments and we look forward to welcoming you back soon. Thank you for your 5* review Natalie. Lovely to hear that you have found a hairdresser with us that listened, and understood what you were wanting (and created it for you!) We look forward to welcoming you back again. Thanks Gemma love my hair colour & also Thanks to Chloe for taking the time to cut & style too. Thank you for your 5* review Heather. really pleased to hear that you love your colour and cut services with Gemma and Chloe. I’m really over the moon with my reshaped bob that Helen did for me. She listened, and involved me. She included looks I wanted whilst adapting them to suit me. & I don’t think it will take too much effort to maintain myself. Well worth the money! I’m so glad I went to Toni & Guy again not many weeks after a cut with ***** who to be honest didn’t involve me and frankly didn’t give me the look I was aiming for. I showed Helen the same photos I liked and Helen tried her best to give me what I loved about these photos. She has made me feel good about my hair again. And I came out smiling this time which is how it should be after a designer haircut! That’s why i go to T & G. I expect excellence & don’t mind paying for it. I don’t want to have a go at ***** by the way. I rarely complain. It’s not personal and I hope he understands I want to be involved when a stylist is cutting my hair. Thank You Toni & Guy. Thank you for your 5* review Star. Really glad to hear that Helen has created a beautiful hairstyle that you like. Sorry to hear that you were unhappy with your last cut with a different stylist. We always try to have a choice of stylists available, should you need to move to another stylist for any reason. We try our best to match clients/stylists up as well as possible, but if that doesn't work out, we can always offer a different stylist, until you find one that you connect with! Thank you for your 5* review Alison, fabulous to hear that Shane and Chris worked their magic and thank you for your lovely comment that we are a fab salon and a credit to the company! Thank you for your 5* review Susan. We do try to create a happy, friendly salon atmosphere to help our clients relax and feel comfortable during their visits. Glad you felt our happiness! Thank you for your 5* review Alison. Great to hear that you are happy with your cut and salon experience with Hellie.